Meilleur Lieu Grace Bay Près de stations sans les prix de villégiature. Ce 2 BR / 2 BA, 2 étages appartement au deuxième étage de la plus grande unité de location dans ce bâtiment est situé dans une boutique de six développement unité de copropriété calme situé à quelques pas des eaux turquoises et plages de sable blanc de la célèbre plage de Grace Bay. L'appartement est situé au milieu de la communauté de Grace Bay. Il n'y a pas besoin d'une voiture, avec certains des meilleurs restaurants dans les Caraïbes, centres de villégiature exclusifs, bars et boutiques, plongée en apnée et plongée sous-marine tout en moins de 5 minutes à pied de l'appartement. L'appartement est meublé dans un style contemporain, comptoir de granite, appareils en acier inoxydable, Kohler luminaires de salle de bain et des plafonds en bois voûtés donnent cette saveur résolument moderne encore Caraïbes. Le balcon extérieur est l'endroit idéal pour se détendre et regarder le soleil se coucher après une dure journée à la plage ou à la piscine. Cette location de vacances est encore renforcée par une piscine commune, un bar et un barbecue communautaire et un espace barbecue communal région, douche extérieure de la piscine et WC ..... Tout située parmi luxuriante végétation tropicale. Nous sommes un grand partisan de POTCAKE lieu. Demandez pour plus de détails. Vols directs de: New York, Boston 3 heures 3h, 15m, Newark 3h, 3h Charlotte, Atlanta 2h, 1h Miami, 15m, Dallas 4hr30m, 3h Toronto, Ottawa 4hr 30m, 30m de 3h de Montréal, Philadelphie 2hr45m, Londres 12hr. Great and affordable place to stay for a larger family. Clean when we arrived. Air conditioners work great! Only reason for 4 stars were due to some unforeseen hiccups- refrigerator was not working and we had to wait for the guy to finish before leaving for dinner (which we were late). Would have been nice to have someone else there. The walk to the beach is safe and beautiful. Neighbors were nice. Owners were prompt and very nice. Fresh TC water cooler was awesome!! Had cooler, beach chairs and umbrellas included! Great location, close to so much! Can’t beat the easy walk to CocoBistro! AAAHHH, Turks and Caicos! There is NOT a more beautiful island!!! It is our second time to the island and we cannot get enough of it. It is our first time renting a house. Our stay was 5 days, 4 nights. The house is located in a GREAT location.....a 2 minute walk to the most beautiful beach and a 5-10 minute to AMAZING restaurants, grocery stores, and more. The owners have left a complete and concise GUIDE to everything that is available in the area. It helped quite a bit. Thank you!!! The house itself is quaint; the rooms are small, but they serve their purpose. The house would need a little upgrade (bathrooms/showers) and furniture is somewhat worn....the chairs in this picture were not the ones in the home. The chairs in the home were wooden, with small, dilapidated pillows on them. We arrived while the cleaning service was there. She was AWESOME and was working hard, but it's a two story house....perhaps a team of two would be recommended. The pool, too, was not clean for two days of our 5 day visit. The pool cleaning service arrived while we were in the pool. They did an awesome job. Once again, perhaps a management system where such details could be supervised and assessed. The WIFI worked sporadically....sometimes yes, sometimes no and only in the living room. The fridge leaked and did not work properly. We had purchased breakfast and lunch foods and only realized the next day that the fridge was not working. The freezer worked as the fridge. The temperature of the freezer was good for maintaining our foods cold, NOT FROZEN. There was an infestation of bugs in the main bedroom's bathroom. We found over 20 insects (sorry, don't know the name of this insect) in the bathroom sink and bathtub. We got rid of them and this was a one time incident. Overall, it's an AMAZING location, quaint house.....just needs a little polish to it. Many thanks for your comments, we choose this unit because of its location and close proximity to the beach and shopping. You mentioned a couple of items that I would like to address. Firstly you stated the chairs are not the same as in the pictures on the site, they are actually the very same chairs as in the picture. The next item mentioned was the pool, the pool is cleaned by our contractor once a week but if you had just dropped me a quick email or even a quick call, I only life 3 minutes away and could of got him there straight away (it wasn't something you needed to deal with). Next you mentioned the wifi, just before Christmas we had a high speed fibber optics system fitted, (again if this had been mentioned we could of got an engineer out to look at the system), but I will say I was picking up the signal by the pool area on the Friday after your departure. We do realize that we need to do touch ups here and there, however its been a crazy busy season with nearly back to back bookings since early December, we do have break in April and we fully intend to update the bathrooms and touch up the living room furniture. We purchased brand new linens bedding and towels in December and had the whole unit repainted earlier this year. We do try to keep on top of things a lot of your negative comments are things that could of easily been put right and put right quickly for your enjoyment and comfort if you had just let us know there was an issue in the first place. This being said we are glad you enjoyed your stay and your other comments have been noted and will be dealt with as soon as possible. The unit was very much as pictured. It's a short walk from the beach and several good restaurants. The A/C works well, the kitchen is spacious, and the front deck is a great place to relax or dine. A few updates to the unit would also be welcome. The LR furniture isn't especially comfortable and some conveniences were missing (e.g., a shelf or rack in the shower, a standard size cutting board, a working beach umbrella, paper towels) but overall the unit was a good place to stay. Great location! Beautiful beach. Close to restaurants and grocery store. Loved being here! Victoria was incredibly helpful in locating a bag we had inadvertently left in the taxi - they called the airport and tracked it down! Property is so close to the beach and walking distance of everything. Clean and comfortable. Thanks again! Our stay in French Riviera was exactly what we where hoping for. 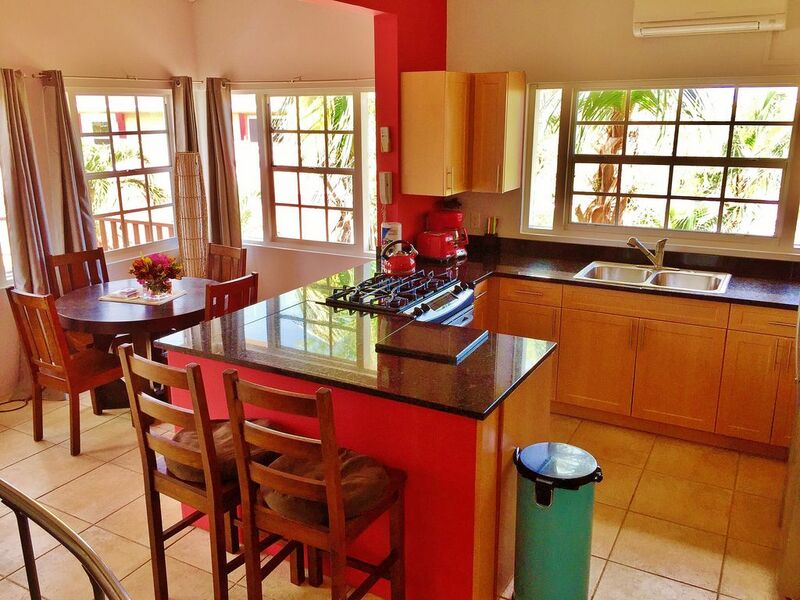 Excellent location, walking distance to restaurants, shops & above all Grace bay beach. The property is maintained to an exceptional stanard & we where extremely comfortable. The amenities such as kitchen & grilling area gave us the option to cook for ourselves as we did on several occasions especially after coming in from a daily excursion & just wanted to relax. This property was perfect for us & I would definitely return. Sam juste derrière les stations balnéaires les plus exclusifs sans les prix de villégiature. A 3 minutes de la plage de Grace Bay, à quelques pas de boutiques et de restaurants.